Prehypertension is highly prevalent but also very heterogeneous entity. 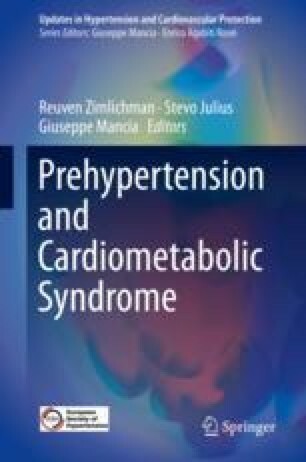 It was observed that some prehypertensives are more prone to progress to sustained hypertension. To identify those subjects who will mostly benefit from early interventions and treatment is scientific challenge but at the same time it is of utmost pragmatical importance. Beside determination of associated risk factors which cluster in prehypertension, it is necessary to detect the presence of subclinical target organ damages. Markers of early cardiovascular dysfunction were evaluated from childhood to elderly on different levels—from endothelial dysfunction, retinal changes, arterial stiffness to left ventricular systolic dysfunction. Pathognomonic or highly specific biomarker for risk stratification in prehypertension has not been identified so far. For clinical judgment it is important to combine several of them (i.e., albuminuria, pulse wave velocity, intima media thickness…). It is interesting to analyze markers of cardiovascular dysfunction in various aging subgroups. Based on current data electrocardiogram, microalbuminuria, left ventricle ultrasound and measurement of carotid-intima thickness could add valuable information in risk stratification of an adult and elderly prehypertensive subjects. As masked hypertension was reported to be very frequently presented, it might be prudent to recommend ambulatory blood pressure monitoring as a starting point in evaluation of prehypertensive subject with any early marker of cardiovascular dysfunction. Nikolov P, Nikolov J, Prbecova M, Deneva T, Vladimirova L, Atanasova P, Hrischev P, Gerogieva E, Nikolov F. Flow mediated vasodilatation and some biomarkers of endothelial activation in pre-hypertensive objects. 2015 Nov 24. pii: wimj.2015.033. https://doi.org/10.7727/wimj.2015.033.